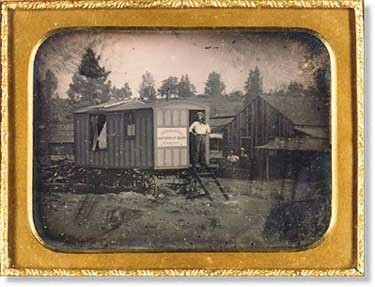 Perez Mann Batchelder (1818-1873), a daguerreotypist, arrived in California in 1851 and operated a travelling daguerreian studio/wagon in Sonora. He grew convinced that the best way to take advantage of the miners' increased appetite for photography was to take the studio into the field, so he managed a series of portable photographic ventures over the next several years. Isaac Wallace Baker, an important California photographer and one of Batchelder's business partners and protégés, here poses in front of his mentor's "Daguerrian Saloon."